Researchers from The Feinstein Institute for Medical Research have discovered that the activation of brain cells called microglia likely contributes to the memory loss and other cognitive impairments suffered by many patients with systemic lupus erythematosus (SLE). The study, which will be published September 5 in the Journal of Experimental Medicine, shows that ACE inhibitors—a class of drugs commonly used to treat hypertension—can block this process in mice and might therefore be used to preserve the memory of lupus patients. Betty Diamond and colleagues at The Feinstein Institute for Medical Research in Manhasset, NY, previously found that lupus patients experiencing memory loss often produce antibodies—called DNRAbs—that recognize both DNA and a critical brain protein called the NMDA receptor, NMDAR. 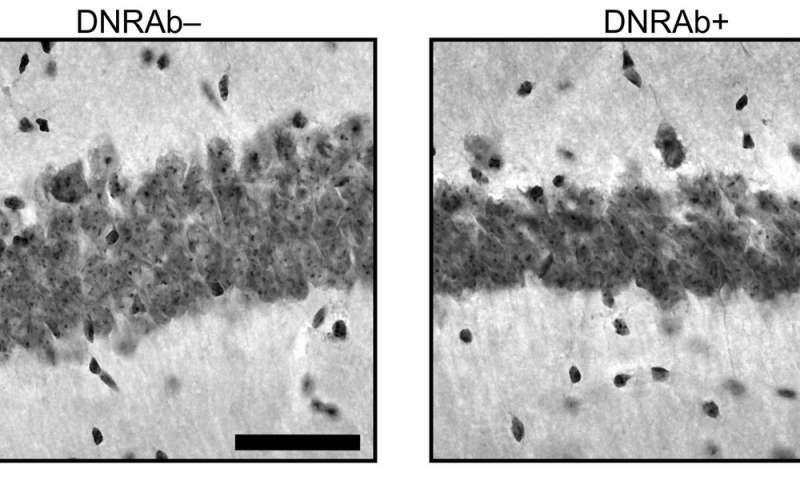 Antibodies are usually unable to enter the brain, but, after injury or infection, DNRAbs are thought to gain temporary access to the brain, where they can target neurons expressing NMDAR. This causes the neurons to die or lose the synapses that connect them to neighboring nerve cells, resulting in memory loss or other cognitive defects.